Rohingyas who have fled the crackdown in Myanmar's Rakhine state have described escaping a scene of horror, often with many left behind. Robeda got out with her youngest in her arms, but the husband and the two other children were trapped inside. Then she escaped her village in Maungdaw, hiding and running for five days until she reached the border of Bangladesh on Wednesday. This correspondent found the Rohingya woman in the Kutupalong unregistered refugee camp in Cox’s Bazar’s Ukhia. At first she refused to talk, believing she was being interrogated by a police or Border Guard man. Even after coming this far, she fears being pushed back through the border, where she will be shot dead by the Myanmar Border Guard Police (BGP) for sure. 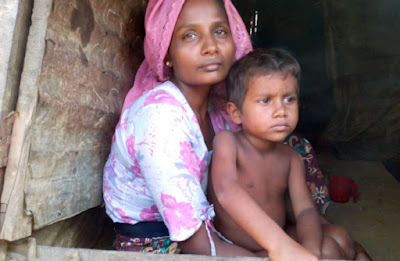 Her home was in Maungdaw district’s Poangkhali village, Robeda said. She and her husband had made made a good harvest of rice, potatoes and chillies this year and were raising a few domestic animals. All was destroyed in the attack that took place a week ago. In Poangkhali, the army burned down the entire village and took away hundreds of men, Robeda said. She has no track of her parents, her two brothers and their families. She said she had seen the burned remains of her father’s house. Achhia and Juhura, two other Rohingya women, said they had swam across the Naf River with others to save their lives. One said her brother was murdered and the other said her sister was raped. Their valuables were looted and and their homes set on fire. 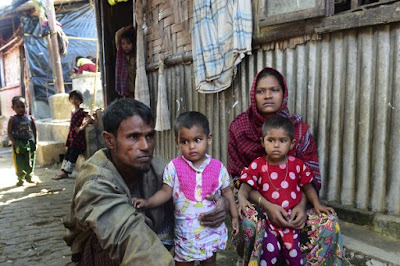 In the Ukhia camp, these Rohingyas are now living with no food, no winter clothes and little shelter. Their statements could not be independently verified. The Myanmar government began cracking down on the Rohingya minority in October after an attack on border guards, but it has repeatedly denied the reports of violence. A Myanmar government-appointed commission led by former UN secretary general Kofi Anan has dismissed the allegations of genocide. But UNHCR says an ethnic cleansing is underway in Rakhine state. A Rohingya man, Nur Mohammad, who is inside Myanmar, told this correspondent over phone that the army’s violence continued every day in the Rohingya populated areas. In his village, soldiers arrested 15 men on Thursday. Every day homes and silos of rice were being set on fire, he said. On October 9, several BGP outposts were attacked and nine officials killed. Rohingyas have been blamed by the Myanmar government for the incident.